One more plush info. Banpresto will release the followings, size 15 cm, game prize. Will update the line up in October and November later. 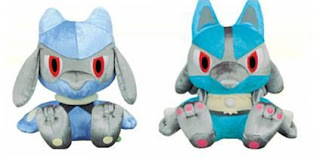 Banpresto will release the following evolution plushies, DX type size is 22-26cm, game prize. MediaFactory will release THAT badge on 27 July officially. Please refer to previous post 'Shaymin Sky Forme Info#3'. How did they come and list in YJ auction, it is still mystery. Subarudo will release 4 figures (3 packages) of 'Pokemon Pose Figure' movie version in the end of June. Size is 7-9 cm, movable figure, candy toys. 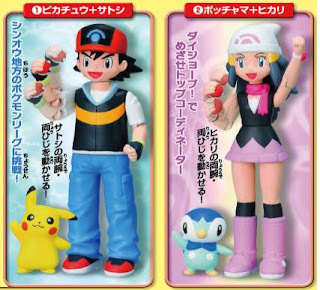 As for previous line up, please refer to Pokemon Pose Figure. 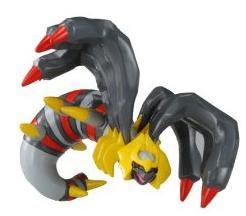 Left Giratina figure will present by pre-order Platinum game. Right one is metallic paint version, it will present to one thousand buyers who pre-order Platinum game and DS lite Giratina edition at Pokemon fan club. These dynamic figures are designed by Kaiyoudo. 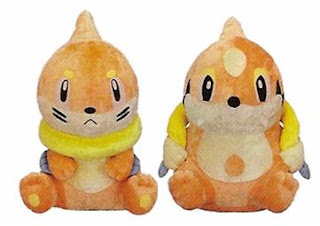 Bandai will release Pokemon Kids special version 12 figures on 15 September. Includes first starter mate from each game series. 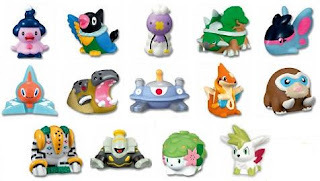 These set are prior released in Pokemon Fair 2008 at SevenElevenJapan as Box set. PokemonCenterJP releases new brand 'Pokemon 151' in 2008 as 10th Anniversary of PokemonCeneter operating. This brand services for adults/older Pokemon fans with the quest for design and quality of goods. PokemonCenterJP believes that you still have a passion same as that time somewhere in your heart. T-Shirt is designed by Polygraph who is famous artist to create 'a world view of game'. For outside, in the house, any occasion, T-Shirt will be suitable. If you will have new topic or communication about Pokemon with Pokemon 151, it is a great pleasure for PokemonCenterJP. No shipping to international, only Japan. Pokemon 151 is a time limit project, it is one of 10th Anniversary business. Future scheme (2009) is unfixed at present. Additional info: T Shirt has 2 colors of neck tag, green and red, selectable. And "19960227-"(game release date in Japan) is embroidered on sleeve tag. Just small information. 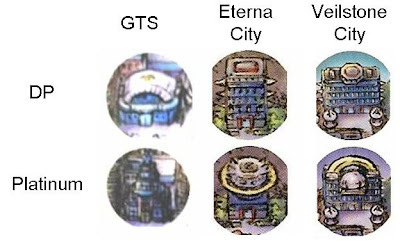 The following three buildings are changing in the new game Platinum. Upper is Diamon Pearl and lower is Platinum in the photo. 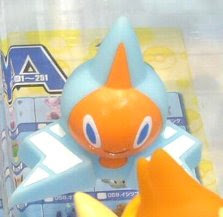 Can't wait Rotom ? Here you are. Tokyo Toys Show 2008 was held on 19 to 22 June. The following new items were introduced as preview at Bandai booth. Pikachu, Piplup, Giratina and Shaymin (land&Sky forme) will be released in the end of August. Pikachu, Piplup, Buneary, Giratina and Shaymin Sky forme will be released in the end of July. Photos are uploading/repleaced in the following previous article. Official site has updated June to August's release items. Please refer to the page for June, July and August. The following plushies will be released from Tomy on 9 October. Will upload the photo later. 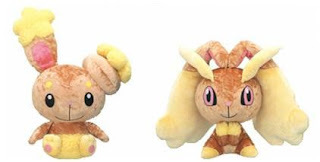 To Eeveevolution fas : As for Leafeon and Glaceon plushies from PokemonCenter (pokedoll), official and regit Pokedolls are sold out in almost stores recently and no more product at present. Please do not miss this chance. What is Pokemon 151 ? It's new brand of Pokemon merchandise for non-kids adults. Subarudo will release 'Pokemon Partners' on 20 July. Canday toys, arms moveable, will update about the size later. Thismerchandise is first figure of Hikari/Dawn. Tomy will release 2 new figures of Monster Collection and 1 figure of Battle Scene on 15 November. Which figure is going to replace, please refer to TomyMC Number List. And as for other Battel Scene figures, please refer to search result. Tomy will release 2 new figures of Monster Collection and 1 figure of Battle Scene on 18 October. As for other Battle Scene figures, please refer to search result. 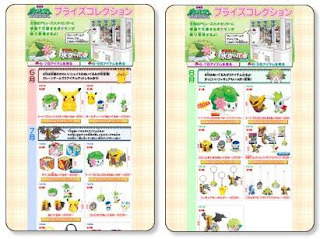 As for previous article Tomy MC in July, Shaymin sky forme will be released on 12 July. Will upload the photo later. As for previous article Choro-Q in July, Shaymin sky forme will be released on 19 July. Photo is uploaded. Tomy will release Shaymin sky forme talking plush on 24 July, preview photo from ANA summer campaign as follow. And updated Merchandise release summary in 3Q 2008 and Figure Release summary. 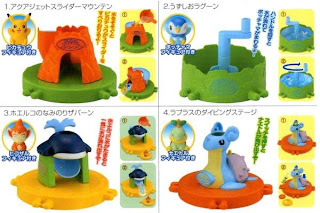 Bandai will release 'Pokemon Water Park' 4 kind of toys on 21 July. 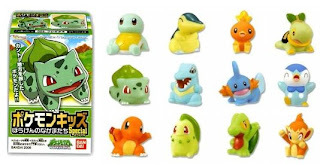 Includes Pikachu, Piplup, Chimchar and Turtwig figure in the toy respectively. Aqua Jet Slide Mountain (Photo 1) : Pikachu slides down by pouring water to mountain. 'ザバーン' is onomatopoeic word in Japanese, meaning is the dash of the waves against the rocks storongly. How to say ''ザバーン' in English ?? Preview photo of Yujin Zukan (Pokedex 3D) DP08 is uploaded. 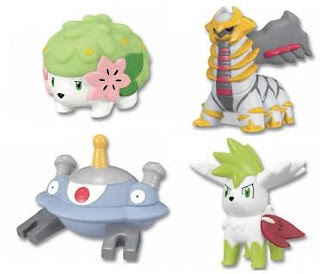 Size of Giratina origin forme is 3.9" (10 cm), Shaymin in diorama, will be released in the beginning of July. Will update the final photo later. 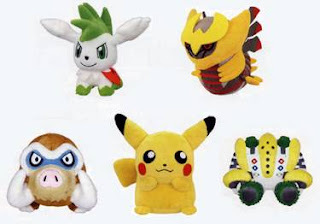 Bandai will release mini plush series Pokemon Friends DP2 on 23 June. Includes Pikachu, Piplup, Piplup, Buneary and Shaymin Land and Sky forme. Candy toys, palm top size. 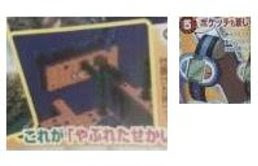 And another Bandai item 'Pokemon Action Key Chain DP2', the photo is updating. 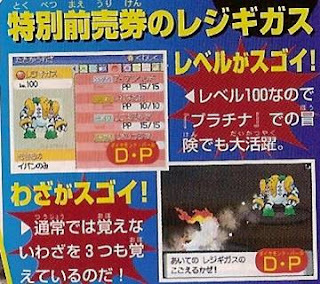 As for previous article 'Pokemon 3D Image Toy', it is interesting in disk toys. Using 3D image technology, the visible Pokemon will be reflected on the disk. CM is now on air, please refer to video posting site. 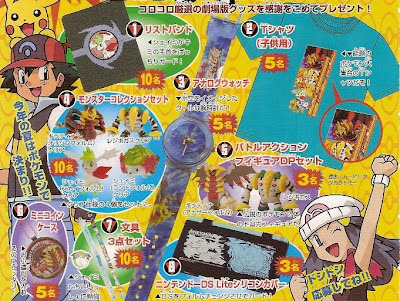 The followings are upcoming merchandise additional info based on Corocoro July's magazine. 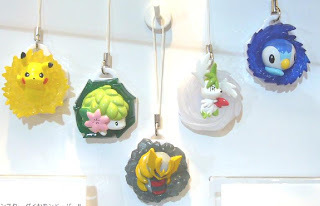 In previous article Pokemon Fair by SevenElevenJapan, photo from Corocoro is uploaded. Includes Shaymin land forme and sky formes. SevenElevenJapan also will handle lottery. 3 grade of prizes, Large figure, plush and soft-case. Probably these items will be released to the market later respectively. In case of Tomy MC clear figures, they released in the movie period in movie 10th, will be same. Shaymin clear figure is also availabe by SevenEleven lunch box. In previous article Pokemon 3D Image Toy, additional present as bellow, poster and celluloid sheet (laid under writing paper). The followings are additional info for games and movie 11th based on Corocoro July's magazine. As posted availability of Regirock, Regice and Registeel with promotion Regigigas in Platinum, how and where catching is by battling at 'Mystery Cave' in Shinoh. The following screen shot is Regigigas performs 'Icy Wind'. Extension mission 'For Bride and Shaymin' is announced. Period : 19 July to 31 August. In the mission, can meet Shaymin. First screen shot : Bride has Shaymin as bouquet. Second : Shaymin runs away. Third : Team Yamiyami also appeared. Flying Shaymin by sky forme is unveiled. For movie visitors, Sticker, Giratina TCG and Shaymin's Battrio pack are presented in the movie theater to the first four milions visitors. 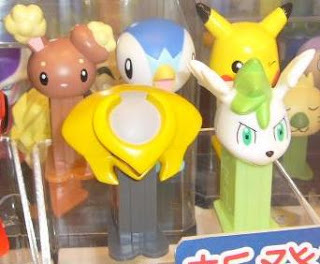 The final photo for previous article Pokemon Strap 2008 Movie version (Bandai) is uploaded. New Pokemon was Shaymin sky forme. This item is the first official 3D shape merchandise of Shaymin sky forme. It will come out on 18 June. Includes clear version randomly. AAPF posted the above previous article on 1 April, everything was started by it. All pieces of puzzle are connected and solved now. Feeling is just finished to read a long mystery novel, included "super lure". Thank you for visiting and your cooperation ! Bandai will release the following 4 figures on 31 August. 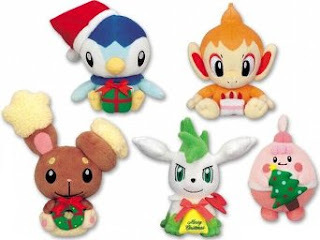 If want to check previous DX items, please refer to Pokemon Kids DX DP series. 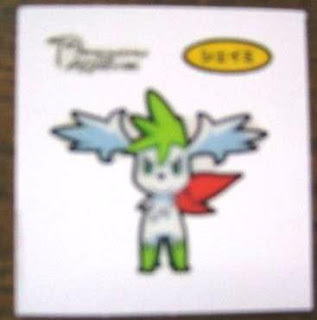 Shaymin Land forme is change to Sky forme when trasfer a Shaymin (receiving at the movie theater one) to Platinum game. As for previous info, please refer to Platinum Game Info. As for Shaymin's voice in Pokemon movie 11th 'Giratina and the Icy Sky's Bouquet: Shaymin', Vanilla YAMAZAKI is performing, it was announned yesterday. Pokemon is the first performance in her career. 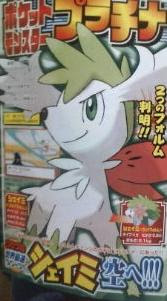 The following scanning photo is Shaymin Sky forme from Corocoro July's magazine. It has been announced officially. Not yet announned release date of Platinum, but booking start on 18 19 July in Japan. UNIQLO Co. Ltd. is a Japanese casual wear designer, manufacturer and retailer. Uniqlo T-shirt project (UT) will release Pokemon 6 T-shirts on 14 June. UT store will present a Shaymin Sun Visor to the first one hundred buyers during 14-15 June. SevenElevenJapan will start Pokemon Fair on 10 July for movie 11th promotion. The following mini-mini Choro-Q car as freebie will be availabe when buying two drinks. It is the first time that Sky Forme's merchandise is announced commercially. [ Edit : 13 July ] the following photo is uploaded from Corocoro June'smagazine. The following item are lisiting at Yahoo Japan auction since 1 June. It looks 'Pokemon Can Badge Collection 5' from Mediafactory, official release on 24 June 27 June. Information from Heerosferret, many thank you !! Baker company Daiichipan starts stickers collection (well‐known as Deco-chara) No.92 recently. The following Japanese blog owner is one of Deco-chara fans. She wrote "realized includes deference Shaymin forme in No.92. 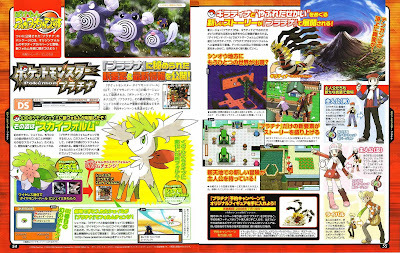 Checked it myself by the net, then understood that also Shaymin can change to other forme, same as Giratina" on 3 June. The photo is appeared today. Thanks to Pokemon Movie thread in 2ch . Photo was found by google cach. Original article was posted on 4 June, before appearing drink cup photo from Pokemon official site. Blog owner deleted original article because someone gave her pressure via blog's comment. And she said there are three kind of Sky forme stickers. Now Pokemon fans especially Deco-chara fans are looking for other stickers before June's Corocoro release. Bandai will release Pokemon Kids DP8 14 figures on 15 July. 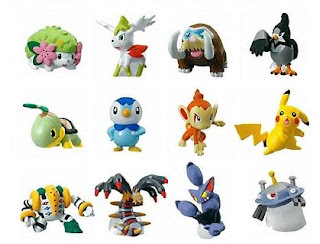 Updated summary list of released figure, refer to Pokemon DP figure release summary. PokemonKids is going to be fully covered DP 106 Pokemons except for Arceus. As for Movie 2008 set, please refer to Movie 2008 set. The photos are uploaded to the following previous articles. Will replace the final photo later. Official Pokemon JP site updated upcoming Pokemon Festa 2008 info today. In the page for explanation of drink place in festa, there was a photo of drink tumbler. Please see the following photo, and check Pikachu left side. Like a white Leafeon is there. This photo and related page have already deleted after few minutes. Thanks to Pokemon Movie thread in 2ch. [ 4th Edit ] If want to check AAPF's article about Shaymin forme, please refer to Shaymin Forme Info. Shaymin "Land forme" is confirmed by the following two sites. AAPF is certain these two are not "sophisticated fishing". If want to check AAPF's article about Shaymin forme, please refer to Shaymin Forme Info. OK, next is Sky Forme. Countdown starting. Bandai will release the followng 12 figires in the end of August. Size is 1.9 "-2.7", candy toys, dynamic pose. If want to check previous Clipping figures, please refer to part 1, part 2 and part 3.